Hair is one thing that complements our looks and make us look pretty. While you stress yourself out by using so many products to make it look good, there are foods that you normally eat that can work as natural hair remedies and can help you have healthier and better hair. 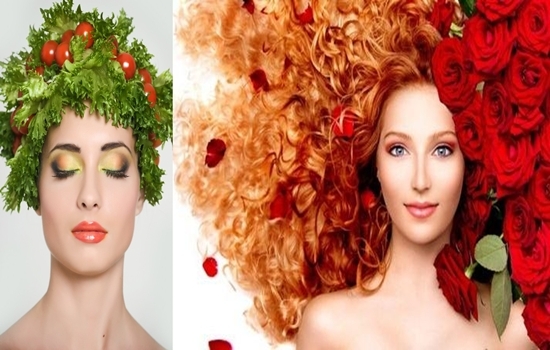 Since it has a lot of protein, Greek yoghurt can work as a great facilitation for hair growth. It contains vitamin B5 which helps the blood gush through your scalp and grow your hair. B5 is an important vitamin that is added to most of the hair products. Cinnamon is known to smooth the progress of blood circulation in your hair as well as pass oxygen to your hair follicles and give hair good appearance. Sweet potatoes can give back the shininess to your hair, as it has beta carotene which keeps hair from drying out and losing its brightness. You can find beta carotene in other foods such as mango, pumpkin and carrots. Guava is a great fruit that prevents your hairs from breakage, as it has an excessive amount of vitamin C which is also very rewarding to your health. This is a vegetable that has the full package, vitamin A,C, iron, and beta carotene. It gives shine to your hair and keep it moisturized as well as protect it from breaking and keep it healthy. Fish in general are known to provide you with healthy fats such as omega-3 fatty acids. These fats don’t only shield you against illnesses, but they also help your hair become brighter and heavier. Oysters contain zinc that help your hair grow and become healthy. You might suffer from really bad hair loss if you don’t get your efficient amount of zinc. what is 6 in addition to 2?